can this below mantra from your list be chanted every day for the rest of ones life and are there any negative effects if chanted incorrectly- for example i read on some yantra website where they use tan tan tan tan tan instead of tam tam tam tam tam. 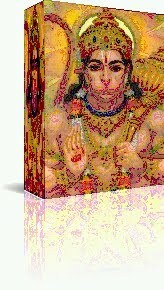 "Purvakapimukhaya panchamukha haumate tam tam tam tam tam sakala shatru shanharanaya svaha"
Yes you can chant the hanuman mantra for the rest of your life. Aaveshay Aaveshay how to pronunce this pls? how to pronounce हं and हुं ? Is this Hang Hanumate Rudraatmakaay Hung Phatt ??? Dear Neel Sir I chant the mantra---Manojavam Marut Tulya Vegam jitendriyam buddhimataam varishtha ,vaatatmajam vaanarythmukhyam sriramdootam sharanam prapadyey 108 times after bath. But in the recent post by Ashok Mehta Jee the same mantra has been restricted by women which I find complex. Sir I am married and I do this mantra after bath with my daily worship. Being married it is arduous for us (women) to follow ultimate celibacy and periods as it is natural and given by god I believe. Though I do not chant this mantra during my periods . Sir You have helped all of us a lot and I have my firm belief only on you. Please guide if I can chant this mantra whole heartedly without any fear from these things or should I not. What was written by Ashok Mehta was in the context of a specific Mantra Prayoga where this is one of the Maruti Mantras, which are used to perform that Sadhana. You can safely continue with your daily Mantra Chanting of the same Maruti Mantra and there will be no absolutely no problems. You have added various colors of knowledge to my life.